We ate at Old Major in the Highlands. I don’t know why, but the Highlands in Denver produces some great eateries, within a few blocks you have Little mans, Lola, Linger, Root down, Forest room 5, Jezebel’s, Old Major and a ton of other eclectic, hip and good food places. But, back to brunch at Old Major. The restaurant is known for their pork (hence Old Major from Animal Farm…a pig) which they butcher, smoke, cure and chop in house…that said we will be coming back for dinner! James went with the pork breakfast burger – Duroc pork burger, DBC bacon, fried egg, American cheese, pork fat french fries, and pickles. I had a small bite and it was very tasty, the fries were very good dipped in my sriracha honey. I had to try the chicken and waffles, and like I’ve said before – there is no best version, just many different takes on the concept. OM chose to use a huge crispy Belgian waffle for the base. They slapped on a wing, thigh and breast of chicken fried with a thin coating to a crisp. The coating was flavorful without being all crusty. I poured the sriracha honey (nice addition instead of syrup) over the lot and chowed down. I gave James a bite, but not more than that. I had chicken pieces left over when I was done with the waffle, so I dipped those in the honey (and the fries too.) Well done fried chicken and waffles! For dessert (yes, you can have dessert for breakfast) we tried the maple bacon creme caramel (maple bacon custard, Denver Bacon Co. candied bacon, bourbon caramel corn.) It was a flan with caramel syrup over it, delicious candied bacon and some caramel corn which made a nice light crunch. The only thing better would have been two of them. We found Lena, a family style, eclectic Latin inspired eatery on Broadway. It was right next to Sweet action ice cream, so two birds with one stone. I know that sounds like a lot of food for 5 people, but again, it’s shared food. The grilled shrimp were the best we’ve ever had – woody, smoky flavor and giant shrimp. The shrimp and grits were very good, nice flavor and big shrimp. The house made sausage was spicy and wonderful. The black bean masa was so good that we ordered another serving. The plantains were crisp and chewy, fried just right. The artichoke tasted like one that James’ Nana used to make, but with a more smoky flavor. Everything was amazing, Hannah ate up her empanadas and we had to order another serving just so we could taste them. Grace shared a few bites of her short rib, but just a few. The drinks were interesting too, twists on classics like the old fashioned – made with mezcal and hibiscus and a ginger mule with fresh ginger that was very spicy. I hear it gets crowded there, but go early and you won’t have a problem. Our waitress was fast and never left us without food or drink. Since we’d never been to Sweet action ice cream and they were practically next door, we had dessert there. Now, you all know that we are Little man fans around here and I don’t think I will ever convert. That said, Sweet action was pretty good. It was handmade and tasted like it, nice and creamy, which we like and had one advantage over LM’s – flavors. They had many more flavor choices than LM’s. So if you like Stranahan’s whiskey brickle, cherry basil, blackberry lavender, after dinner mint and the like, Sweet action is the place to be. The line is long, but moves fast. Don’t expect to eat it inside the restaurant though, that place gets packed, so be sure you can walk and eat ice cream at the same time if you go. Flavors change often, with new ones like Cadbury creme egg popping up, so check the site for the flavor list (but not all the flavors are on there) before you go. Last night James and I went out to Crave for dinner. It’s billed as a dessert place, but their entrees and drinks rival their desserts. For starters we went with the cheese plate; it came on a piece of slate with each cheese paired up with an item that enhanced the flavor of the cheese. The Stilton was paired with dried apricots which gave a sweetness to the tangy blue of the Stilton. The Irish cheddar was paired with candied walnut and the Peppercorn rustico was paired with cherries. You could also do a meat plate or mix some meats with cheeses. I was sipping a Chocolate is the answer martini with the cheese, not the best choice to pair with cheese, but it was really good. For dinner I went with the small plates, I had try the bacon wrapped dates and the curry potstickers. James took the filet with greens and fingerling potatoes. Their take on the dates was to stuff them with an apricot goat cheese and wrap them with crispy bacon. The sweetness of the cheese and date balanced the salty crunch of the bacon – it was better than Linger’s version. The potstickers were fried, filled with lamb and the curry dipping sauce was awesome, though I would have preferred the dish steamed instead of fried, it was still very tasty. James’s filet was a bit too rare for my taste, but very tender and flavorful. Dessert was hard to choose from. They have some new Spring desserts that aren’t on the on-line menu, things like the Fluffy Fat Elvis and the S’more. In the end I went with the Strawberry Sangria – a shortbread cookie topped with strawberry and kiwi slices, topped with coconut sorbet with a side of prickly pear moscato ice cream on top of spun sugar. James had the Hazelnut cake – a layered fudge cake filled with hazelnut cream topped with chocolate ganache with a side of buttered pecan ice cream. The two desserts were very different, mine was tangy and light, James’s was dense and complex. There were many more things on the menu that I would like to try and way more desserts than I had room for, we’ll be coming back for sure. James and I made reservations for McCormick and Schmick’s. This review will have to include the horrible service we received, it does counteract the food and if you don’t have 2.5 hours for dinner and want to be denied dessert, then you may want to skip the place for dinner. It could be that we just had a bad waiter, other diners seemed to be progressing at a fair pace for dinner. But, we did wait for a long time to receive drinks, food and not get our dessert. If you think you could survive service that is lacking, then read on. The atmosphere was rich, green carpet, mahogany wood, stained glass and leaded glass, velvet curtains, it reminded me of the Broker. The drinks were pretty darn good. They used fresh squeezed juices, top shelf spirits and the drinks they made were very tasty. The Kentucky bourbon smash and old blue were our favorites, the pear martini was very good and the Spanish coffee was also nice. The appetizers were spot on, the crab stuffed mushrooms were full of crab (unlike some stuffed mushrooms that are stuffed with bread) and had a creamy sauce. The crab tower was an artful presentation of avocado, mango and lump crab meat with an orange sauce on the side. It was very light in flavor and we added just a sprinkle of salt. My entree was cashew tilapia with string beans and butternut squash couscous. The fish was flaky and creamy with a crunch of cashews, the beans were…beans, the couscous was very flavorful and I liked the bits of squash throughout it. James had the swordfish with spinach and mushrooms. He said it was very good, the fish was not oily or fishy tasting and the vegetables were well seasoned. The waiter came by with dessert menus and here was our snafu. We wanted the bourbon pecan pie, but they were out of it. So, we went with the upside down apple pie with ice cream. We got our dessert drinks and waited. And waited. Finally we asked for the check and asked about dessert – was it still coming? Oh, our server said, I thought you canceled dessert because we didn’t have the pecan pie. Um…..no, we clearly ordered the apple pie instead. He was not at all apologetic about the mix-up and when the manager came over – nothing was said about it. I wanted to leave a penny as a tip to let him know the service sucked, but James left a tip that was under 10% instead. We will not be going back, the food is good, but I could not abide by the service for a second time. James and I got to try another restaurant on our list – Jezebel’s. It’s in the Highlands (what awesome restaurant isn’t?) It’s Southern food and drinks, I was looking forward to some grits and other items. I had the chicken and waffles and I’ve decided that there isn’t just one place that has great chicken and waffles, there must be at least two, Euclid’s and Jezebels. Picture this – a Belgian waffle cut into fourths. You place a waffle on the bottom and add a crispy chicken strip, then a slice of crispy bacon, then a fried egg, then a dab of Nutella, top with the other waffle, spread honey butter and slather the whole thing in syrup. Yeah, I know – amazing awesomeness in every bite. James had the 3 egg Cajun omelet – boudin and andouille sausage, red bell and poblano peppers, white cheddar cheese. I had cheese grits, he had home fries (the grits were better.) If you go, make a reservation, it’s a small place and with food this good I’m sure there is a wait on a nightly basis. We ate at La Biblioteca, but we didn’t know that it was attached to it’s sister restaurant Zengo. They are both Latin/Asian fusion places; La Biblioteca is a tequila bar with tappas and shared plates while Zengo is more sushi, full meals and cocktails. Our restaurant was quiet, elegant and lit with candles, Zengo was more modern, louder and lit differently. That said I want to go eat at Zengo because I looked at their menu on the way out and it all looked good. Both are located at Riverfront park in downtown, right across from the park and Platte river. It was happy hour when we got to La Biblioteca, so we ordered some drinks and appetizers and then a shared plate meal. We started with sushi, but the shrimp was cooked tempura style. I don’t like sushi, at least I didn’t think I liked it, but this roll with avocado, shrimp, rice, fresh ginger and soy changed my mind. Next up was the achiote hoisin pork slider with house-made pickles and won bok slaw. I could have eaten about 10 more of those spicy, crunchy, tasty treats. But, tacos and noodles beckoned. We shared carnitas rice noodle – pork, mushrooms, snow peas, carrots, egg and cashews with hot and sour sauce and pork carnitas tacos – chile pasilla sals, avocado, pico de gallo, cilantro in corn tortillas. The carnitas was spicy, but not too much and the flavors all melded together. The tacos were good, the pork wasn’t as flavorful as it was in the noodles, but everything in it was fresh. James tried some tequila that smelled very strong. I tried a grilled pineapple infused margarita – I could have had a few more of those (if they didn’t have alcohol in them!) For dessert we had the choice of Littleman in the snow or staying at La Biblioteca and getting a dessert there. We chose to stay and had the modern mexican bar – spiced chocolate bavarian mousse, peanut nougat, chocolate feuilletine crust, salted caramel ice cream and the flourless chocolate cake – cardamom ganache, mexican crema ice cream, vietnamese coee anglaise, sesame tuille. What can I say….amazing. Very good dinner, drinks and dessert, can’t wait to try Zengo’s. Finally, I’ve been wanting to try the food at Steubens for awhile, we just haven’t been there. So, we were in the area one day and I took the girls to lunch there. Bethany’s fried chicken with potatoes and biscuit looked amazing, I had a burger with raspberry onions and goat cheese (great combo) and the girls had a cheeseburger with fried corn, french fries and fruit, cucumbers and carrots. I saw that they have chicken and waffles too…..might be coming back for that! milk chocolate ∙ salted caramel ∙ peanuts and praline ∙ rice krispies ∙ chocolate ice cream and the creme brulee. It’s a good thing we don’t live close to this place! First, make reservations for this place. Twelve is a restaurant that has 12 tables (hence the need to RSVP) and serves 12 food items (18 if you count dessert) that change each month. So, I don’t have what we ate for the month we went, but it was delicious! I like the rotating monthly menu, you could eat there once a month and not have the same meal twice. The restaurant was dimly lit, romantic and not too loud, since there weren’t that many people seated. Back on the street (the bar and pie shop are underground) we perused our options for eating: The Smokehouse, Tomayo, Bistro Vendome and we settled on Euclid Hall. It was packed inside and really loud, so we ate outside on the patio, the weather was 70 and perfect for that. Euclid Hall has a bit of history attached to it – it was built in 1883 as a house for Dr. Byron Albertus Wheeler, Euclid Hall has been home to the Masons, the Colorado Women’s Relief Corps, The Cootie Club, Maudie’s Flea Market and is even rumored to have once been the very fancy headquarters of a brothel catering to government officials, law enforcement and members of the media. It was also the site of the City Hall war in 1894, but I’ll let you find out about that. Okay, so the food at Euclid was a-mazing. I had a hard time deciding what I wanted to eat because it all sounded good. In the end we had the Chips and Dip: lemon goat cheese dip, oolong tea smoked duck breast, duck confit, Kennebec potato chips, baby dill, extra virgin olive oil. What can I say about this unique dish – it had layers of taste, from the lemon goat cheese to the warm confit to the cold thinly sliced roasted duck…..Bon! For dinner I had the Chicken and Waffles: crispy chicken mousseline and confit “nuggets”, sourdough waffle, black pepper Béchamel, maple gastrique and James had the Oyster Po’Boy: potato bread, bacon aioli, Jorel’s hot sauce, cucumber, red onion. I almost didn’t order the chicken and waffles because some night I’m going to have Lola’s version, but seeing as how the two versions are totally different, I didn’t think this meal would jade my like/dislike of the dish. The chicken and waffles was another unique dish that had layers of flavor and was so, so, very good. From the chicken to the sourdough waffle, the sauce…everything was good. James’ sandwich was huge, he had to eat some of the fried oysters out of the sandwich to make it a bit smaller. He said it was spicy and good, it looked very tasty. We decided to forgo dessert and grab an ice cream at Little Man’s, which was a bad decision as the line was backing up all the way to Linger’s front door. Standing in a line 50+ people deep to add ice cream to the top of everything else wasn’t appealing tonight, so we skipped it. So, I highly recommend Green Russell for drinks (they have appetizers there too, we just didn’t get any) and Euclid Hall for dinner (make a reservation or grab a table out front, those are first come first serve.) We will need to go back and try more off each of the menus. Yum! Saturday night James and I went to a restaurant that has been on our list for awhile, Lola. It’s in the Highlands right next to Little Man ice cream. 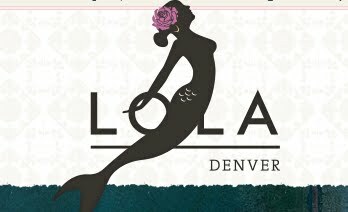 Lola is an eclectic coastal Mexican restaurant with a bar that has over 200 tequilas. One word of advice, call ahead for a reservation more than a day in advance! I got us in by calling ahead and getting there early, it was packed. smoked red pepper salsa, lime crema.) The guacamole was perfect, it was spiced just right and the fresh garlic was a nice added flavor. The chile poppers were amazing, the goat cheese was melt in you mouth delicious. For dinner James had the Chimayo Seared Mahi with poblano shrimp & grits, bacon okra tomatoes, and aji amarillo. The fish smelled wonderful and I was jealous of his okra and grits, but then my meal was better than his (in my opinion.) I had the Chile Relleno with roasted squash, ‘hazel dell’ mushrooms, black beans, smoked goat cheese, in chile rojo with shrimp and a side of the hash. The relleno was spectacular with the goat cheese mixed with squash and mushrooms, the shrimp were grilled and I mixed them with the chile and black beans. The hash was an interesting combination – sweet potatoes with chorizo in a bacon and herb sauce. It was so good, spicy and sweet with a great bacon flavor. For dessert, yes we had room (barely), we had Honey Polenta Cake (tequila poached pears, papaya jalapeño purée, and caramel popcorn) and a coconut pie with a side of guava sorbet. The polenta cake was a wonderful combination of flavors, spicy, sweet and crunchy; I loved it. The pie was baked in an almond pie shell with brown sugar and huge shaved slices of fresh coconut. Think of a pecan pie without the pecans and add coconut and you’ve got the idea. The interior of the restaurant was busy, but not overly crowded or loud (we sat in the covered patio.) It was dark, but not so dark you were blind to your surroundings. The wait staff was impeccable, on time and was full of great suggestions on drinks and food. We will definitely be going back to Lola’s to eat, next time I’ll make my reservations earlier! James and I went to Linger for dinner and loved it. Linger is in LoHi right next to Little Man ice cream. It resides in the former Olinger mortuary building. They kept the sign (love that) and transformed the building into a hip place to eat. The restaurant is dark, soft lighting from above and candles on the table provide the only light when the sun goes down. They have a very Hitchcockian view out the windows, if you like Hitchcock you will appreciate it. Linger went wild with the mortary theme. The drink menus are metal medical examiners tablets with drinks like ‘corspe reviver’ and ’embalming fluid’, don’t worry it’s really not. Oh, and make a reservation, it was Tuesday night and the place was packed, we were lucky to get a table. It’s got worn blue carpet, rooms filled with fake vines and flowers, a round room with port holes, and servers dressed as pirates – cool. We wandered around the other rooms (we were the only customers there), there are some pretty interesting rooms. The food was really good, we had cheeseburgers, coconut shrimp, corn dog, artichoke spinach fondue and a giant piece of chocolate cake. C’mon, it’s shecky but it’s fun. James and I went out to Forest Room 5 (a Westword pick), I’ll forgive them the loudness because their food and drinks were awesome. The restaurant had all the doors open and we had a nice breeze coming in, the tables, stools, menus and even bathroom sinks were carved out of wood. The lighting was very dim and we had a candle on the table. We ordered 4 sets of tapas, just because we wanted to try more food than if we ordered an entree. We had the eggplant risotto, saganaki (Kasseri cheese from Greece in a flaming vodka sauce with peppers and truffles), fried calamari with a mango chili sauce and seared scallops with a saffron orange sauce. I only got a picture of the last two dishes, they were all very, very tasty. The scallops had a woody flavor from the searing, the calamari was very tender and I loved the sauce, the cheese was wonderful and the risotto with eggplant chunks was delicious. I tried a drink called ice on the tracks (double espresso vodka, chocolate, cayenne pepper and cinnamon) wow, it was very spicy! Thanks again Westword for a great pick. We decided to skip Santa Fe and go to Old Pearl street for their art walk. But first we needed sustenance, so we went to Budapest Bistro. Now, if you happen to see that a place doesn’t have a children’s menu that usually means they don’t want children there. This place doesn’t have a children’s menu, but if you think you can show them how polite and pleasant your children can be during dinner – take them with you. If you have kids that run around tables, don’t ruin it for the rest of us. We got seated at a table next to dark red walls with a small cut out window laden with candlesticks; we had fancy glasses filled with water that everyone drank with care and we were quiet (the noise level was very low when we got there.) We started off with the garlic bread, two giant, crisp puffs of fried bread with fresh garlic cloves and sour cream-cheese dipping sauce. I ordered the schnitzel pork loin fillets layered with smoked ham and cheese, breaded and fried, mashed potatoes, red cabbage. The schnitzel was thin and crisp with the melted gouda stuffed inside it, it tasted wonderful with some mashed potatoes on top of it. The girls had beef goulash, the world renowned dish that made Hungarian food famous! Tender, lean chunks of beef simmered in paprika meat sauce, mashed potatoes, vegetables. They also had some dumplings. Bethany said that she would never eat mashed potatoes again without the sauce that was covering them. For dessert we had to get the Gundel Palacsinta – walnut cream filled freshly baked Hungarian crepe with hot chocolate-rum sauce. Flambéed at your table, yes it was. Budapest Bistro was a lovely place, warm and quiet, with Hungarian wines, an aroma of beef, pork and spices mulling around. You’ll find them on Pearl street at 1585, if you are visiting at peak dinner times you might want to make a reservation, the restaurant is cozy and fills up fast. Then it was time to visit another new place, the Crushery, which happens to be right next to Budapest Bistro. (Sorry, it’s gone now!) We found this place with the Westword wheel of wow (there’s really no Westword wheel of wow, just a restaurant guide on their site.) We will try the Crushery again for their bagels (which are crushed), but the thing that was calling us tonight was the -321 liquid nitrogen ice cream. It makes the ice cream freeze fast, which makes smaller ice crystals, which makes creamier ice cream. You can mix in a ton of flavors, which is how I came up with – vanilla, lavender, rosemary, brown sugar, sea salt. It was very tasty, you could taste the lavender, crunch the sea salt and the rosemary and brown sugar balanced each other out. Steve Spangler shows you how to make nitrogen ice cream here, but really for 3 bucks you can have the Crushery make it and pick whatever ingredients you want. Bon appetit! Grace had Hawaiian – tomato sauce, mozzarella, provolone, “Primo” pineapple chutney, pulled pork and Hannah had cheese and kalamata olive. We also tried the special dessert pizza, pumpkin, here’s the chalkboard pizza pie ingredients. It was very, very good….all of it. We sat in the garage and listened to a live band playing while we ate our pizzas. I thought the place would be packed, but it was very slow, which was great for us. Awesome, interesting pizza – try it! It is decorated like a Victorian era saloon. Even the workers get into the act wearing custom costumes. The details were pretty amazing, from antiqued wallpaper, to fancy moulding, padded leather seat backs, ornate carpet and chandeliers. The player piano was a hit with the girls, while Joel found his favorite game in the arcade. In some reviews people complained that you have to order first and then order drinks at the bar, but as soon as you walk in there is a table with menus, so you can look over before you go up to order. I’m not sure why you order drinks separately, but it wasn’t that complicated. They could have an old fashioned shootout downstairs if it weren’t for the huge salad buffet in the middle of the room. I got one trip to the salad bar and that thing was packed full of fruits, veggies and all kinds of extras. Their lunch menu was cheap, the girls all got 7″ pizzas for $2.35 or so. Bethany had shrimp pizza, Hannah had cheese and pineapple, Grace had pepperoni, I had Hawaiian and Joel had pepperoni. The pepperoni was so good, it was small, crunchy and they curled up when baked and a tiny grease puddle rested in each round slice. Nothing better than crunchy, greasy pepperoni slices. While the kids played in the arcade I wandered around looking at the stained glass, antique ornaments, and pictures on the walls. There was player piano music going on the whole time making for a very cool atmosphere. I felt like I was in the movie Somewhere In Time, only the salad bar ruined the Victorian image. Where to eat…..I had several options, but in the end we chose a place that we saw Adam from Man vs. Food eat at, the Buff cafe’ (their motto: Eat in the Buff.) It’s in a crappy building on the corner of 28th and canyon, I think it’s an old hotel lobby building or something. The dining rooms are mismatched, the plates, cups and seats are mismatched and it was the most wonderful food I’ve had in a long while. Adam was right! We started off with the pecan caramel quesadillas, very tasty. Glacier ice cream in Boulder, Yum! To say the least! We stopped into Glacier before picking up Joel one night. We had a hard time picking a flavor from the over abundant containers of ice cream and gelato. There were 3 varieties of Oreo ice cream, the peppermint ice cream had York candies in it, there was chai ice cream and more. I had the peanut butter fudge gelato and it tasted just like the peanut butter fudge from the top of Pike’s peak. We tasted caramel Oreo, chocolate cookie dough, and 2 more that I can’t even remember the names of (probably because I had to read over 30 flavors to the girls to get them to choose one.) Look here for a full list of all their delicious flavors, the key lime pie looked really good with bits of crust rolling around in the ice cream. Unfortunately for us they have their main location in Boulder and a few others that are north of that, bummer. But, if you are up in bustling Boulder stop on in and grab a cone, you won’t be sorry! 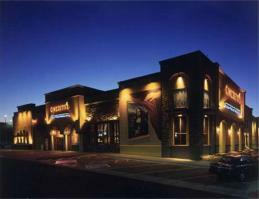 Rodizio grill is a Brazilian steakhouse near Union station on Wynkoop in downtown Denver. James and I went there on a date night and it was awesome. Firstly, the grill has gaucho servers with skewers of meat at your beck and call. Over 12 different kinds of meat and even more fruits and veggie arrive at your table as you eat. You have a pillar with red/yellow/green on it. When you’re ready turn it to green and gauchos with sizzling meats arrive ASAP, turn it to red and you’re done for now, leave it at yellow and they know you’ll be ready for more soon. Side dishes at the table are Brazilian cheese bread, polenta, and banana fritas (ohh, this was very good.) The side bar was much better stocked than Fogo, it had pasta, black bean stew, potatoes, salads, quail eggs, cheese, beef stroganoff and more. The sirloin with garlic seasoning, spicy chicken, ham and pork loin were our favorites. They also came by with grilled pineapple, grilled veggies and grilled tomatoes with a sauce on it. It was jam packed so reservations are highly recommended. It was not too loud although it was very busy and we were stuffed at the end of the meal. The garlic seasoning used on many of the meats was slow roasted into them and the flavor was just perfect. The side of banana fritas were happily consumed and they kept them coming. I would say that there is definitely more variety on the the side bar and foods at Rodizio compared to Fogo, it was an excellent experience. Though pricey (less than Fogo though) you are paying for top quality meats served in a interesting fashion. Ok, first off if you go to Fogo make reservations. We had s 6:30pm reservation for 5 and there were a few people there, but when we left it was packed. Fogo de Chao is a Brazilian steakhouse, what does that mean? It means if you’re on the Atkins diet you just died and went to steak heaven. They have 15 varieties of meat roasted up and served on giant skewers. If you’re ready turn your card on the table to green and they will come with a huge hunk of meat and slice away. When you’re taking a break turn the card to red. We had fillet minion, bacon wrapped chicken, parmesan pork, ribs of all kinds, sausage, more chicken, sirloin, and more. If you want it well done, they will go back to the kitchen and find some meat that is well roasted. Sides arrive at the table as soon as you sit down – mashed potatoes, caramel bananas and polenta (like cornbread.) There is also a side bar that has salad items, chicken, tuna and pasta salads, cheeses, olives, peppers, mozzarella, asparagus, artichoke and so on. They have a delicious lime drink that is lime juice, sweetened condensed milk, ice and sugar, get it and you’ll satiate your sweet tooth between bites of mouth watering meat. Kids were half price, but don’t be fooled, this was an expensive restaurant. The girls ate like birds, Joel ate everything put in front of him and Grace and I finished off our meal with another round of parmesan pork. We all agreed that the fillet mignon, bacon chicken and parmesan pork were the best items. Fogo de Chao is located on Wynkoop and 15th in downtown Denver. After dinner, stroll across to Larimer street where lights hang across the walkways and find a coffee shop to relax in. At Il Vicino we were a bit taken aback. You order your food first like at a fast food joint, then go sit down. The restaurant we went to was on Santa Fe and was cozy inside. We sat down and got our drinks, they make their own root beer there and it had a very licorice flavor to it (so…yum!) I had the combo which was a small pizza, salad and drink. My salad was the spinach one. It had spinach, Gorgonzola cheese, red peppers, pine nuts, red onion and a pesto dressing. It was very good. My pizza was the Bianca – spicy oil, mozzarella, ham, mushrooms, caramelized onions, goat cheese, rosemary and tomatoes. James had the da Vinci – marinara sauce, mozzarella, ham, mushrooms, tomatoes, artichoke and oregano. The girls had Alfredo pasta and a cheese pizza. The pizzas had a thin crust that was wood fired, slightly charred which made it taste great. The goat cheese on my pizza had melted into the whole mix and was just wonderful. it was a pretty cheap eat for 5 people ($32) and was delicious. We like to eat and we go to lots of places that others might not know of, so here is a review of Pizza Republica near I-25 and Bellview. This is an upscale pizza place (they serve their water from glass bottles!) The pizza is Neapolitan style, not really sure what that means, but it was good. We sat at the pizza bar because that’s the only place where there was room for us. But, the kids liked watching the guy roll the dough and seeing the pizzas go in and out of the oven. Instead of shredded mozzarella, they use sliced chunks of the cheese, big slices of fresh roma tomatoes, pearl onions instead of sliced onions and lots of different toppings. My pizza was a white one, so an olive oil base with mozzarella, tomatoes, bacon and pearl onions. One thing Pizza Republica offers is local produce and foods. My salad was arugula with Haystack farms goat cheese, pistachios and dressing, it was great; Haystack makes great goat cheese. James’s pizza had sausage, fried garlic and onions on it, also a white pizza. They missed his order so as we were waiting on it on the fly they sent over a red sauce pizza with fried garlic and cheese on it topped with arugula. I liked the white pizza better, but that fried garlic was a nice touch. Joel had pepperoni pizza as well as Grace, Bethany had cheese and olive pizza and Hannah had noodles. We ate everything (including the extra pizza) and the girls also got a gelato. Go here to see location and menu info. So, if you go, sit at the pizza bar (especially if you have kids)…definitely order the goat cheese salad and the cheese bread and bon appetit! Last night (because I felt I didn’t have enough cultural with just the Fox theater) James and I went to Seven cups tea house for an Erhu concert. Seven cups has a monthly performer (which we just found out about) and is in the historic business district of Pearl street (which we just found out about.) They serve many, many teas. Oolong, black, green premium; the menu, which was all teas, was several pages long. Here is the description of our tea: this tea also grows in the central part of the Wu Yi Mountains known for its mineral rich soil. The traditional medium roast of this tea creates a strong full-bodied flavor with a hint of dark chocolate. The lingering aftertaste leaves a slightly sweet taste and characteristic cassia aroma. The rich flavor and many infusions make this a great choice as an everyday rock oolong tea. We chose the oolong rou gui tea in a pot for 2. It had a very slight chocolate flavor and a very strong tea flavor and was pretty good. I think the pot was $9 and we had it refilled once with hot water, we drank a lot of tea. We also had a mochi dessert (sticky rice) this one had lima bean paste in it, in fact most of the desserts have lima bean paste (but being a connoisseur of Vietnamese desserts, we’re used to that.) Our mochi also had chestnuts in it, and having had chestnuts roasted over and open fire, yeah it tasted like chestnuts. We also had ginger cream ice cream and it was good. It was like eating some ginger candy and sticking ice cream in your mouth, ummmmm…. The café was decorated with Chinese lanterns, mahogany tables with carvings in them, wood carvings a beautiful carved screen and of course, teapots. The band played for over an hour while we ate and sipped our tea, it was very nice. What was even better is that finding seven cups meant that we found Pearl street and as we drove down it we found probably seven good looking eating places, from burgers, to pizza, French, Italian and American. Instead of writing down every restaurant, I just wrote Pearl street. Seven cups has tea by the cup, pot, loose in jars to take home and in round wheels. They do free tea tastings, tea ceremonies and sell tea ware. They have game nights, performers, desserts (most importantly ice cream) and it’s just a cool place to go have some tea. We headed over to Cafe Berlin for dinner and I was hoping that my 3rd anniversary dinner pick out of Westword (we went to Z cuisine one year and The Entertainers the next) would be good – it was great, wonderful, amazing! We started off with an appetizer of bratwurst and sauerkraut. There were 3 kinds of brats and the sauerkraut is made in town and then the Cafe simmers it in butter and sugar before it’s served, it was delicious. I have never had better sauerkraut, most places just pour it out of a can; Cafe Berlin takes the time to have it handmade and then simmered to perfection. Next we had a cucumber dill salad, again homemade with sour cream and dill and fresh cucumbers, yum! For dinner I had sauerbraten with spatzle and fried potatoes. The sauerbraten was fork tender and spiced just right with gingersnap sauce. The spatzle was homemade with bits of that wonderful sauerkraut in it and the fried potatoes were just right. James had the rouladen, red cabbage and sauerkraut (he shared that kraut with me, it was just too good!) His rouladen was fork tender and all the flavors of onion, pickle, mustard and meat melded together into a mouth-watering dish. His red cabbage was cooked just right, not too limp, not too crisp. The Cafe was small and cozy, beautiful paintings on the wall, beer steins, German music and posters of Marlene Dietrich gave It a European flair. If you want a great place for a special dinner or just a place to try some awesome German food, Cafe Berlin is the restaurant for you. Make reservations, you’ll be glad you did! The manager at WCG told us that Cinzetti’s is owned by the same company and that they have kids eat free Monday and Tuesday nights. I probably would have shied away from Cinzzetti’s when I learned that it was an Italian buffet if not for the fact that the food was so divine at WCG. We went to eat there last night and it was an incredible experience. If you’ve ever been to Casa Bonita you know you go there for the atmosphere, NOT the food – at Cinzzetti’s you go there for the atmosphere AND especially the food! They have created an atmosphere of an Italian village; when you walk in there are tile floors, fountains, lion heads on the wall spouting water, trees to eat under, balconies decorated with flowers and foliage, very neat. We sat down and our waitress, Kendra, explained how it works. She said if we went to the center court fountain we’d find pizzas and pasta, in the back were main entrees, salads, made to order crepes and on the way back soups. Also a gelato bar and desserts fresh from the oven. 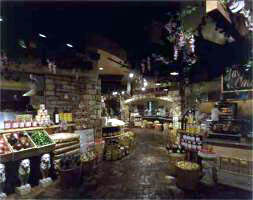 Don’t think of it as a buffet as much as a place where you can get primo Italian food fresh and when you want it. The pasta guy was constantly making new dishes and stirring sauces (they only put a little pasta out at a time, but they have about 8 choices at a time.) I swear you could starve for a week and come here and still not taste everything. I tried the farfalle carbonara and it was perfect. The honey garlic chicken was moist and had a wonderful flavor. The Italian sausage was almost as good as mine (sorry, I’m not giving that up!) The meatballs tasted homemade and I didn’t have any room to try the crepes or pizza, although Joel had both and there wasn’t any evidence left over for me to sample, so it must have been good. For those of you in South Denver, like me, yes it’s worth the drive. Although people who know me know I don’t mind a drive, it was worth 45 minutes (there was a little traffic) to get there. It’s near some stores too, so you could go early and then hang out at Borders and go to Borders after you eat (but you’ll be too full to get that Javanilla shake, can you tell I like Borders for more than books?) This would also be a great place to take out of town visitors. We went to the WCG at Park meadows last night for a date night (yes, we still do that.) It was WONDERFUL! First, they have a date night menu every night of the week. You get to share an appetizer and dessert, get your own salad and entree and it is well worth it. The atmosphere is dark and contemporary. There was music playing in the background and although the restaurant was packed and people were talking, we could hear each other and the music too. We had about a 40 minute wait, so I would make reservations or go on a weeknight for a shorter wait time. For the price of the date night, the food we received was both superb and ample. We started off with the grilled artichoke. It was excellent, almost as good as James’ Nana used to make. The remoulade sauce was also very good. I have to hand it to whomever first tried to eat an artichoke, they must have a had a time. This one was wood fired grilled tasting, tender and well seasoned. Next came our salads. Normally I don’t care much for salad, it’s just weeds that people put on a plate and call food (field greens, please that’s just a fancy name for weeds.) James had the Caesar and I had the WCG blue cheese salad which had mixed greens, Maytag blue cheese, smoked bacon, candied nuts and red onion. It was very good, I loved the flavors of the candied nuts and bacon, very nice. Next came our entree, James had the rare prime rib with mashed potatoes and I had balsamic vinegar grilled rib-eye with couscous. The steak smelled delicious, it was medium rare and juicy. I can’t remember when I have had a better steak, really, it was tender and the flavors were awesome. The couscous was served cold with grape tomatoes, raisins, nuts and a yogurt vinegar sauce that was wonderful. This is the way couscous is supposed to taste, I’m sure of it. James said his prime rib was very good, it was roasted well and just the right temperature. To top off our dinner we had the molten chocolate souffle cake. Again, this was not a disappointment. The outside of the cake was crunchy with chocolate and inside was a moist chocolate cake. There was white chocolate around the plate and whip cream on top. Our server Kyle was on the ball but never too slow or too fast. We were able to eat each course and talk and enjoy ourselves without feeling rushed. I heartily recommend going to the WCG for a date night. Kyle said all the food was wonderful and if our sampling is any indication, go ahead and order whatever you like, you’ll be pleased. We went here for our last anniversary, the food was good, but the music was great. Live jazz plays Thur-Sun nights, make reservations (it’s a small place.) Don’t be alarmed at the location, when you walk in you are in a different place entirely. It was very romantic and the service was good. The food is international so you can try things like Salmon In Saffron Rice, Shrimp Creole from Spain, Seafood Crepes from France and traditional favorites like Rack Of Lamb, or go Italian. If you like live jazz and piano this place can’t be beat. 2239 & 2245 West 30th Ave.
We went here for another anniversary dinner. Z Cuisine is a charming French Bistro and Parisian Wine Bar, located in the historic Highlands neighborhood, minutes from Lodo. The food was fantastic and the service superb. The atmosphere was that of a romantic french cafe, make reservations! Though a bit pricey, it’s a nice place for a romantic get away with the love of your life.